The Adventures of an Intrepid Reader: Christmas wrap up! I am slowly recovering from the cold that I managed to get for Christmas. My goodness I felt terrible for the last couple of days. I sound as though I am coughing up a lung still but I do feel a bit better! Might still have to have a nap or two today! Santa was good to me. No books, but that is because at least some of my family members believe I read a bit much! He bought me a new bag (which I really needed), a new cast iron frying pan (which I really needed), some earrings, a vase, some vouchers, Abba Singstar, a Top Gear DVD, Pink's Funhouse. For the boy there was an iPod Shuffle (so I have been spending a while trying to figure out how to work the darn thing! ), a new bike, a book, a Futurama DVD, Kung Fu Panda DVD, some Adelaide Crows merchandise, a Battleship game, some Transformers, a Bakugan amongst other things. I decided that seeing as I was doing so well with the vegies, I would try a couple of other plants, so now I have not the one or two I was thinking of, but six pots full of fuschias. My mother thinks that I can go from killing everything I grow to growing cuttings in one easy step. I am not sure that I agree with her, but we'll see I guess! Speaking of growing things, we ate our first piece of home grown produce yesterday. Here it is, before it was gobbled up! ooh, nice strawberry! I hope it was good. Of course it was, it was a strawberry! Merry Christmas Marg! That strawberry looks delicious! Merry Christmas! Sounds like you had a wonderful day although given the weather I have been posting about lately, the thought of a fresh grown strawberry at Christmas cracks me up! Good luck with the gardening! I kill everything, so I just stay away from greenery. Kailana, I nearly always kill everything too which is why going from going from one pot plant to six including from cuttings is such a big deal! Nymeth, it was either that or Star Wars Clone Wars and he had seen that earlier in the week! Kim, luckily we don't get that extreme here even in winter, although it does get very hot! Wrap up warm. Teddy Rose and Morgan, it was! Now we just have to wait for a couple more to come up! Merry Belated Christmas! Sounds like you had a good day. And that strawberry does look delicious! Glad you're feeling better! 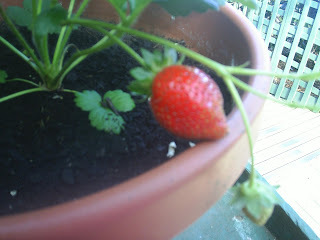 I really want to grow strawberries again when we finally get moved into our new house. Ipods... so great... but so confusing at first, especially when compared to previous technology. *take cassette tape out of case. *put cassette tape in tape player. *press play *enjoy. I love strawberries and that one looked so yummy. They are so expensive where I live right now. So I will have to think about growing some indoors. Sounds like you had a great holiday. Looks like you've got yourself a lovely green thumb! I am Jealous! I really don't have a green thumb at all. That's why I get excited about actually ending up with some fruit!